What does your tattoo signify to you? Most people are surprised to find out I already had a tattoo. 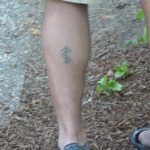 Clean-cut white guy with no sense of style, very polite, very little cussing, worked for a bank… that guy has a tat? But yeah, it’s tiny and one color and in a place that’s often covered up. So. Anyway. Emma modified her drawing to my specifications, and Aaron redrew it to make it more tattooey (for skin instead of paper). It’s on my left forearm, so a lot bigger and more visible than the first. 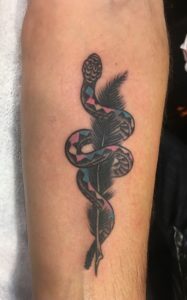 Emma’s tattoo was the medical symbol of a staff with a snake wrapped around it, but she changed the snake to a rattlesnake and added the words Don’t Tread On Me. I decided a quill (for writing of course) suited me better, though I kept the rattler. The color pattern on the snake is blue-pink-white-pink-blue, repeated; this is the pattern of the trans flag. (As you know if you’ve read my blog much, I am the proud father of a trans woman.) While I don’t think of my writing as venomous, I do want it to have bite, and the rattler reminds me not to be timid in my writing. Do you have one or more tattoos? Do they have significance beyond aesthetic appeal? Let me know in the comments. Author PeterPosted on March 20, 2018 March 20, 2018 Categories Gender, Uncategorized, WritingTags tattoo1 Comment on What does your tattoo signify to you?